DURHAM, NEW HAMPSHIRE—Outdoor track season moved to the University of New Hampshire this past Saturday, June 9, for the New England Championship meet. There, local schools – Westbrook, Gorham, Bonny Eagle, Windham, Lake Region and Gray-New Gloucester – all repped proudly. Of particular note, Blue Blazes superstar Nyagoa Bayak won the High Jump with a leap of 5-11.00, besting her nearest competition (Allyson Lewis of Connecticut) by two inches. Bayak’s fellow Westbrooker, Dominic Creenan, also traveled to the meet. Creenan, who’s been a little off in recent weeks, is (amongst other things) a powerful hurdler, but he missed the event finals this time around. Gorhamite Evelyn Kitchen finished ninth in the Triple Jump, while teammate Anna Slager crossed the line in the 1600 in 18th. Slager, Kate Tugman, Iris Kitchen and Meadow Fortier combined for 14th in the 4×800. Among Gorham boys, Anthony Chase finished 23rd in the 3200. Bonny Eagler Kayla Raymond finished 22nd in the 800, while Christine Toy finished 10th in the 1600 and Ami Beaumier 17th in the 3200. The trio – along with Emma Abbott – competed together in the 4×800, and finished 12th. Several Gentlemen Scots were on-hand as well. Aiden Willey took 20th in the 1600 and 30th in the 3200; Derek Cole, Max Harris, Andrew Pendleton and Alex Sprague took 18th in the 4×100; Cole Pendleton, Sprague and Zack Allocca took 16th in the 4×400; and Allocca came in 23rd in the Long Jump and 24th in the Triple Jump. The lone Patriot to make the journey, Andrew Peterson competed in the 100 Dash, but like Budroe, missed the finals cut. Finally, Laker Sam Desouza finished 20th in both the Shot Put and the Discus. 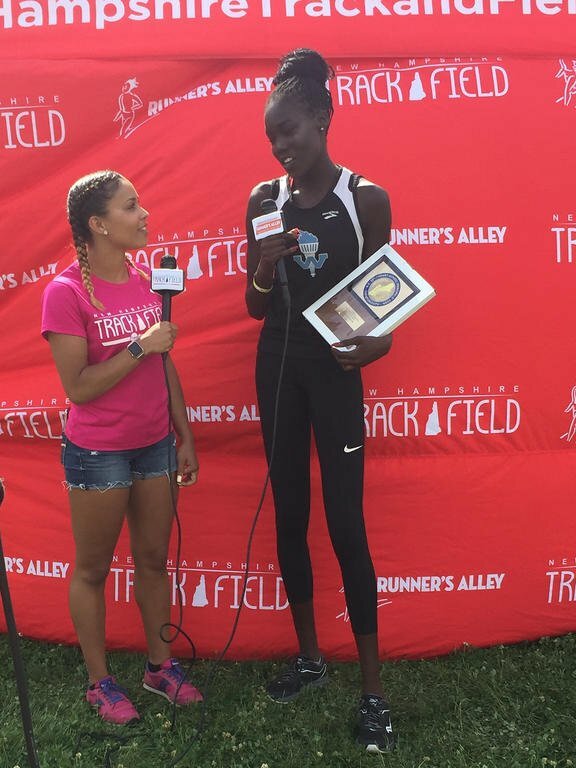 Nyagoa Bayak interviews after her High Jump win at New Englands. Photo courtesy of Angie Lally.